The truth caught up with Fiji's dictator on 02 November 2000, when CRW soldiers attempted to kill Bainimarama for betraying them. Bainimarama had ordered them into parliament to overthrow the government, while he was safely out of the country. Then on his return, Bainimarama pretended to be Fiji's saviour, especially when the coup didn't go according to his plans to rule Fiji. 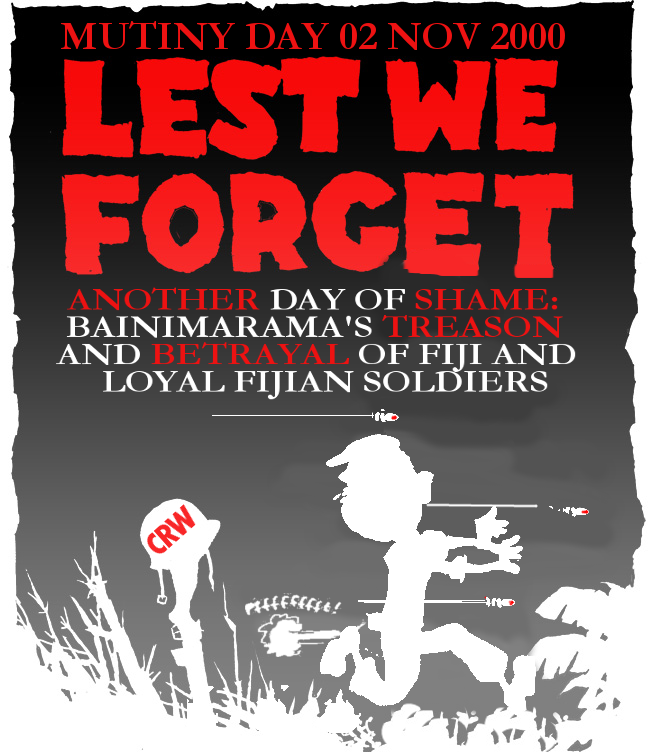 So Bainimarama betrayed the loyal CRW soldiers and accused them of being part of the conspirators. Bainimarama had them arrested, beaten, tortured and imprisoned for treason. While pretending to be Fiji's saviour in 2000. Bainimarama did not save Fiji in 2000, he played a key part in the 2000 Coup. Now Frank Bainimarama wants the world, and certainly the people of Fiji, to believe that his record is not blood stained, that his motives are noble and that he is nothing but a selfless servant of the higher cause of a pure Fiji. But the actual record of what he said and did (or did not do) tells another story. Bainimarama's actual narrative is littered with lies, paranoia, betrayals and self aggrandizement, a man escaping from the law, not doing his sworn duty to uphold it. Click this link Fiji's dictator, Frank Bainimarama's Truth Revealed to read all about it. See also FijiLeaks, BLOODY 2 NOVEMBER 2000: The day Bainimarama wanted mutinous soldiers punished (some innocent) thirteen years ago -- kicked to DEATH. The Police wanted to question him over the CRW murders before 2006 coup! We must never forget the evil Bainimarama has done and continues to do to Fiji now, or we may be doomed to repeat it!